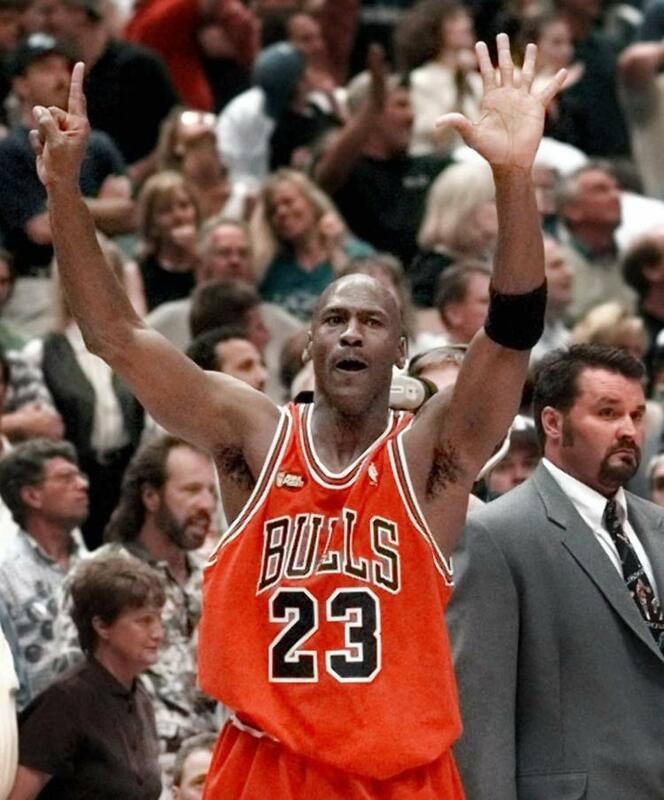 Michael Jordan is and will continue to be the greatest NBA player of all time. In the playoffs, there hasn't been a single player better than him over the years. 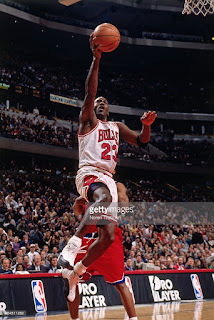 He made the playoffs ever year of his career in Chicago Bulls, and over those 12 and a half seasons (really just a fourth of a season in 1995), Jordan racked up a number of amazing playoff performances. A look at his playoff record shows that Jordan averaged over 30 points per game every single playoff season, which is why he's the leader in playoff scoring. His scoring average in the playoffs alone is 33.4 PPG, which is beyond amazing. Today, we wanted to take a look at his greatest performances. There's at least 40 I could list here, but we'll look at 10 of his greatest, the best of the best. Let's get into it. -There's been much to say about Jordan losing in the first round of the playoffs, BUT, the reality is, no one talks about the competition he was facing during this time. 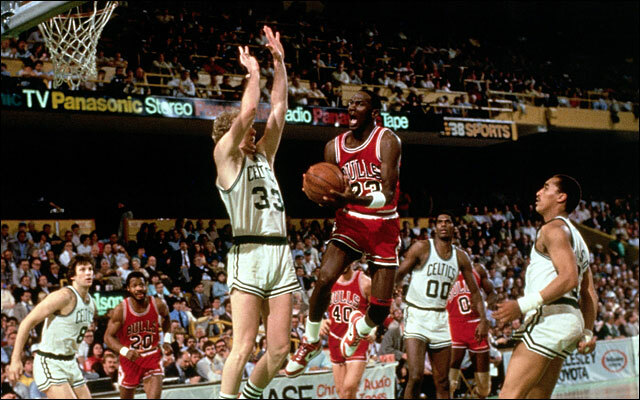 As the Boston Celtics were the best team in NBA, dominating the East, Jordan was earning his stripes as a top tier player, just two years in. After an injury sidelined him for most of the season (64 games), the Bulls managed to make the playoffs with a horrible record (30-52). The Bulls were essentially a bad team, but when you have Jordan on your team, it's pretty safe to say, you're in good hands. 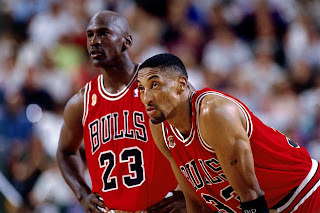 Perhaps if Jordan had played more in the regular season, the Bulls would have had a chance to get out the first round. 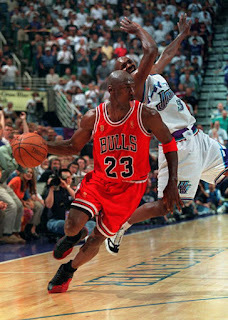 However, what Michael would do in this game is probably his greatest performance ever for a few reasons. For one, efficiency. Jordan came into this game ready to play and win, and he wouldn't go down without a fight. With the game going into 2 OT periods, Jordan took over and nearly won the game for his team. Though the Celtics won, Jordan would make history with a 63 point performance on 22 of 41 from the field, which is a rather efficient shooting night. This was only his 2nd season in the league, and we saw exactly what he was going to become: The Greatest. -First off, let's start with this tidbit: Jordan averaged 39.8 points per game in this series against the Cavs (hey, ESPN, Fox Sports, Colin Cowherd and Shannon Sharpe... what was it you said about Jordan never having a series like LeBron in the first round?). He was completely in the zone during this entire series, scoring at will, but there would be no better game than his game 5 finale to put the Cavs out of their misery. The shot heard around the world would be what turned Jordan into an instant legend and is probably the most infamous shot of his career minus that famous last second jumper in 1998 (I'll get to that). 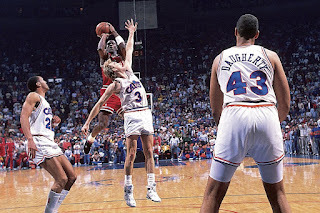 As the clock was just about to go off in the deciding game of the 5 game series, Jordan took an off balance jumper over Craig Ehlo and sent the Cavs home. He finished with 44 points on 17 for 32 shooting, 9 rebounds, and 6 assists is about as good as it gets in a playoff game. Jordan was letting the world know he's the best and this was the stamp on that statement. -By the time Jordan was joined by Pippen, he was already the best player in the league. After eliminating the Cavs, Jordan was on a mission. He had just put up nearly 40 points a game in the Cavs series, and he started off his series against the Knicks with something that he had never done before: a triple double in the playoffs. With all the emphasis placed on triple doubles this season, I thought it was fitting to include this game. 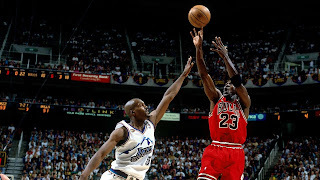 Jordan would finish with 34 points on 11 for 17 shooting (extremely efficient), 12 assists, and 10 rebounds. 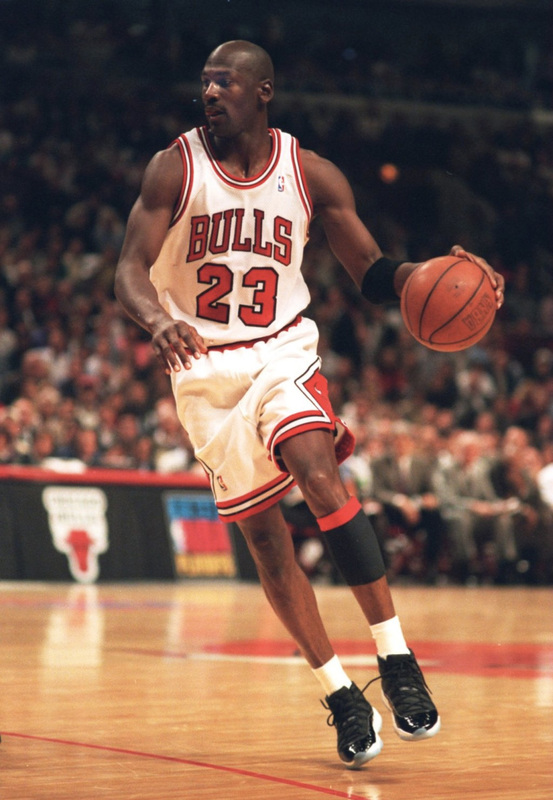 This is one of the most dominant performances in Jordan's playoff career, as he finished with 35.7 PPG, 9.5 RPG, and 8.3 APG, nearly averaging a triple double in the whole series (I could have included his 40-15-9 night also from this series, that's how brilliant he was in this series). 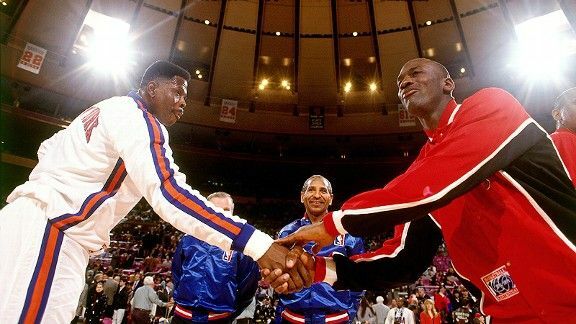 He was so good that the Knicks coach at the time, Rick Pitino crowned Jordan the greatest after the series was over. This was in 1989. Two years before he won his first title. Amazing isn't it? -The game that forced the Jordan Rule to really be implemented. 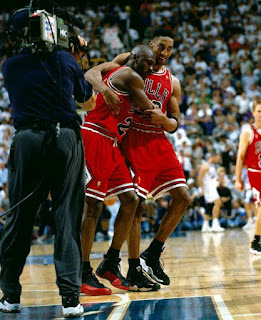 Jordan seemed reafy to move onto the Finals for the first time and I don't doubt that the Bulls would have won over the Lakers this go round. However, this game is extremely important to his legacy. 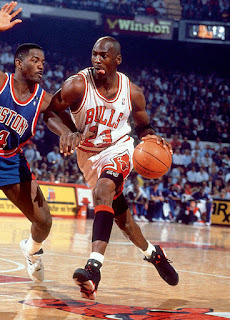 Finishing with 46 points on 16 for 26 from the field, as well as 7 rebounds, 5 assists, and 5 steals, it seemed to be apparent that Jordan would dethrone the Pistons, and I truly wish he did. Jordan getting over that Pistons roadblock would have guaranteed that he would have won his first NBA Title two years earlier, and might have been the difference maker going forward. History would be so much different if the Bulls ended the Bad Boy Pistons before they even got started with their championship runs. 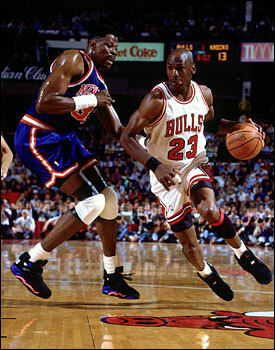 This is how good Jordan was, he put legendary teams in jeopardy during their prime. -This is the infamous "shrug game". Jordan walked into the series ready to secure his 2nd NBA Title. He was so focused, he would break a record, putting up 35 points in the first half for the most points ever in the first half of a game. Jordan, who wasn't the best three point shooter himself, would go on a run and knock down 6 three pointers, and do the infamous shrug that many remember. He finished the game with 39 points and only played 34 minutes, which is amazing in a NBA Finals game 1. -There are plenty of classic Jordan games. This is for sure one of them. With 54 points on 18 for 30 shooting, as well as an amazing 6 for 9 from the three point line, how could we not include this near flawless performance from the GOAT? After going down 2-0 in the series against the Knicks, the Bulls won game 3, and then led them to a huge game 4 victory, 105-95 to even it up at 2-2. This was yet another great perfomance in 1993, a year in which Jordan had another amazing year, won a scoring title, but was not named the MVP (he should have been IMO). However, in the playoffs, Jordan would craft one of his greatest performances ever. 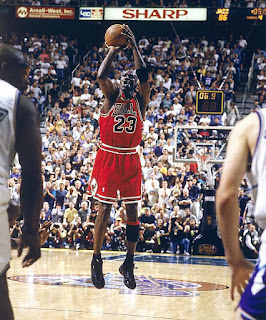 -I'll always say this: Michael Jordan had the greatest perfomance in NBA Finals history. His 1993 Finals run is the greatest I've ever seen. Yes, it's better than LeBron in 2016 (which isn't even top 3), better than Wade in 2006 (but that's close), better than Shaq in 2000 (though he was amazing) and it is better than the 5 other Finals runs that Jordan had. Jordan seemingly had something to prove, which coming off of back to back titles and making the Finals a third time, it was an odd position to be in. 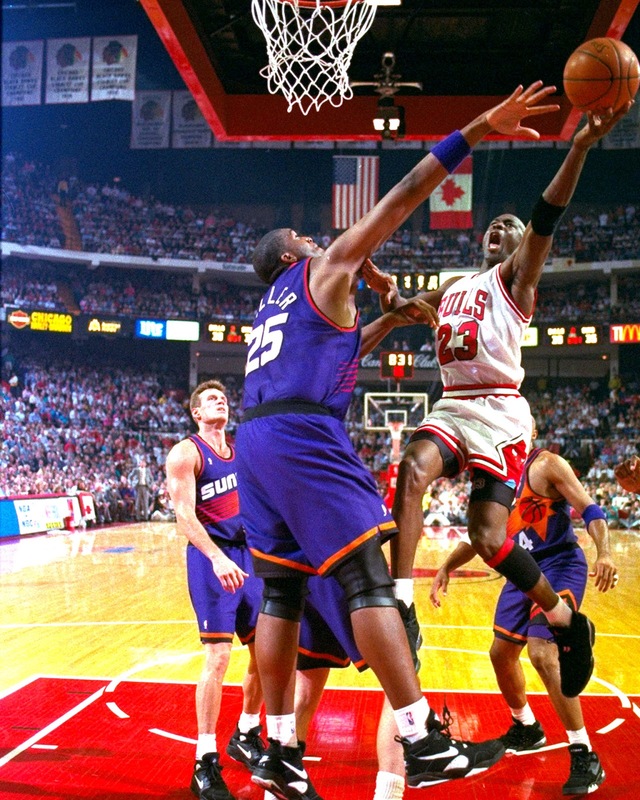 Jordan was facing his friend Charles Barkley, who was given the MVP award, and make no mistake about it, Jordan was focused on destroying the Suns. In Game 4, he did just that. With 55 points on a 21 for 37 shooting night, along with 7 rebounds and 4 assists, Jordan led the Bulls to a 111-105 victory over the Suns to take a 3-1 lead in the NBA Finals. 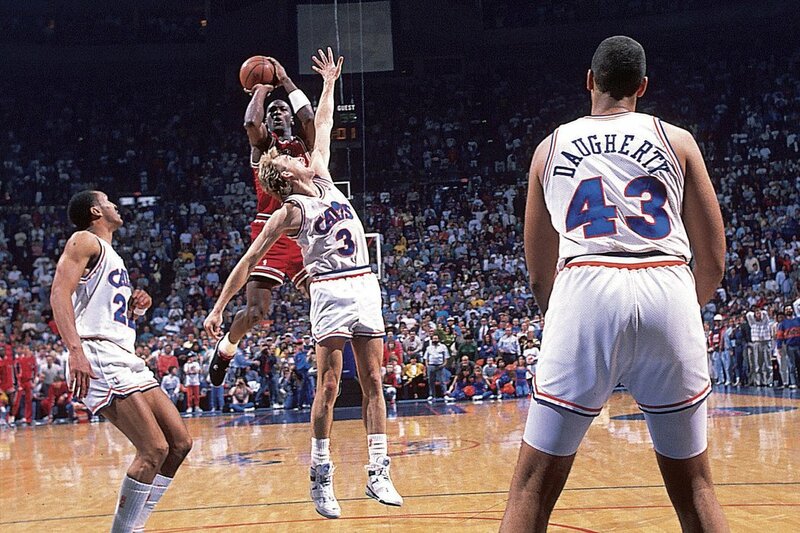 Let us not forget that Jordan averaged 41 points in this series, which is still unreal, even in this era of scoring. -There are quite a few slept on performances from Jordan and this is one of his most efficient games. With the Bullets leading at halftime, Jordan seemed to take over and lead the team, with 55 points on a very solid 22 for 35 shooting and a perfect 10 for 10 from the free throw line. The Bulls were set to make easy work of the Bullets, but the Bullets were a tough team, and made Jordan have to really take over the game, which of course led to their downfall. If there's one thing that Jordan has in the playoffs, it's extremely efficient shooting. It never fails. This was yet another mind blowing performance. -So, the "Flu Game". Of course this is here. There's no way you talk about Jordan and you don't actually mention this game. It's impossible. After the Bulls took a 2-0 lead, the Jazz fought back to tie the series up 2-2. In Game 5, battling the "flu"/stomach virus, Jordan showed up looking a bit weaker than usual, but he played and fought through it. He would be magnificent in this performance, battling back from a deficit to help the Bulls take the win. Unlike most of his performances, this wasn't his most efficient, but he finished with 38 points on 13 of 27 from the field, with 7 rebounds and 5 assists to give the Bulls a crucial 3-2 series lead. This is one of the most infamous performances in his entire career, not just the playoffs. -A storybook ending. The final shot of his Chicago Bulls playing career is honestly one of the toughest performances in his career, a final testament to how great he was. Jordan wasn't at his most efficient this game, and the Jazz had a three point lead with a minute to go, but Jordan worked his magic. 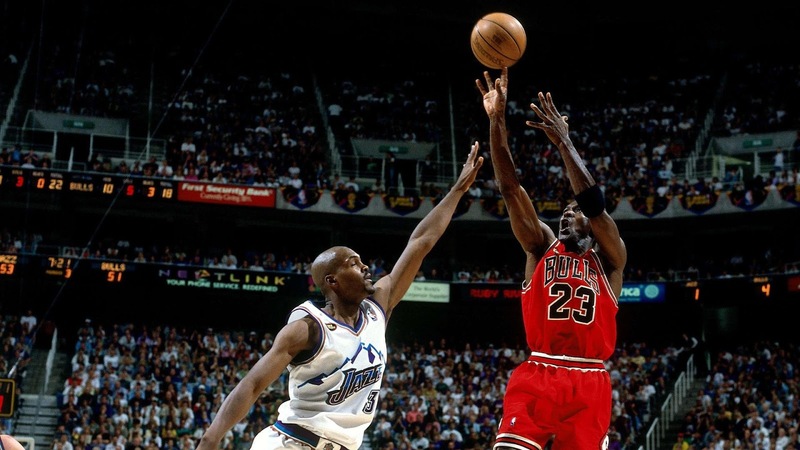 After a drive to cut the Jazz lead to one, Jordan would make one of the biggest defensive plays of his career, stealing the ball from Karl Malone and running up the court. As the clock continued to go down, Jordan proceeded to take a big time shot over Byron Russell (with a slight push off) to take the lead for the Bulls. 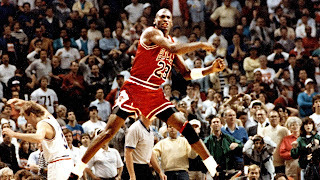 The Bulls ended winning the game 87-86 and won the NBA Title, Jordan's 6th and final championship. It's the perfect way to end your career. 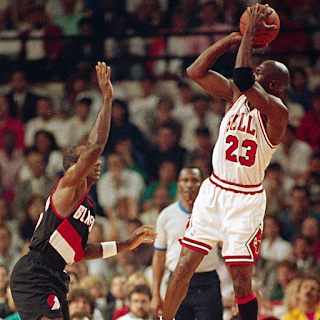 Jordan finished with 45 points on 15 of 35 shooting, but the efficiency wasn't what mattered the most here. It was the will to win. It was the tenacity. It was the drive. Jordan is the greatest, and these 10 performances showed why.